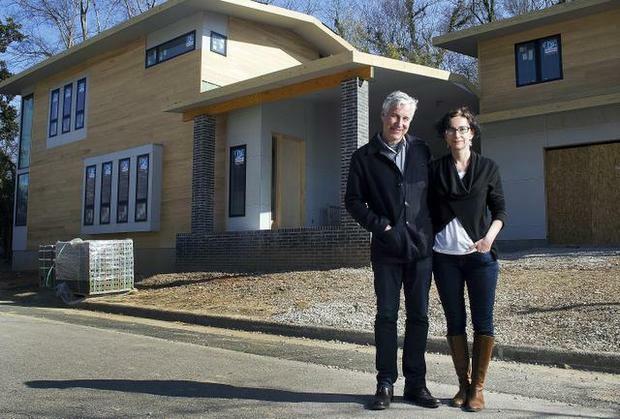 The Cherrys in front of their half-done “modernist” house in Raleigh. A modest modernist house a Raleigh, N.C., historic district has all of Christendom up in arms. Paul Goldberger has ridden to the defense of the couple, the Cherrys (he’s an architect), who are building the house, arguing that the city’s historic development commission should not rescind its prior approval of the building. Here is Goldberger’s critique in Vanity Fair. He is correct that the board’s action ought to stand. His mistake is to assume that it’s a matter of style and history, that the neighbors deserve his rebuke for trying to freeze-frame the neighborhood in time rather than allowing its stylistic variety to continue to reflect the march of history. But the neighbors are not striving to halt history. They are not upset because the building flouts the neighborhood’s historic character. That is merely the only language they know how to speak in public on the subject. In fact, they dislike it because it lacks the aesthetic credentials to occupy their historic district, which features a variety of old styles. That is – to put it in language they are not supposed to use – the house is ugly. The problem is that even mannerly modernism cannot really fit in. Modernism refuses on principle to fit in. Its attributes are in natural contradiction to attributes of houses that normally occupy historic districts – and, in my opinion, in natural opposition to houses that most people would consider beautiful. Houses of many different traditional and vernacular styles can fit pleasingly together because they all are descendants of classical architecture – even though they may not literally feature the classical orders. The neighbors are right to consider the Cherry house too ugly for the neighborhood. What the Cherrys have designed is not a modernist house but a house that has compromised its modernist credentials in order to fit in. The result is not modernist but rather a very poorly done traditional house that does not qualify to be in the neighborhood. Why did the Cherrys bother? If they wanted to build a modernist house, why not pick a more contemporary neighborhood? To try to suss out their intentions, it seems that they probably wanted to fit in, but with an “edge,” yet could not figure out how to do so without betraying their own aesthetic convictions. Rather than sell their lot and buy one to build in their real taste elsewhere, they decided to brazen it out. That is not good manners and it is no surprise that the neighbors are cranky and see right through them. But the neighbors are not blameless. Anytime a new house is proposed in a historic district, it is up to the neighbors to make sure that the official bodies charged with maintaining the historical character of the neighborhood do their job. The neighbors rose to the occasion here only after the fact. The board erred in approving the building, but that is probably because it did not realize the neighbors would be so offended by it. After all, to the members of the board it must have seemed like merely a traditional house of poor design. Why invite the hassle of blocking it? And if they are anything like architectural review board members in Providence, they probably have their own difficulty balancing their personal taste with their civic responsibility. The members of the board in Raleigh probably think more like Goldberger than like the residents of the neighborhood they are charged with protecting. This entry was posted in Architecture, Preservation and tagged Cherry, Historic District, Modern Architecture, Paul Goldberger, Preservation, Raleigh. Bookmark the permalink. creating a never ending stream of opportunities. because online publishers are able to republish them online free of charge. I’d be delighted to hear your thoughts on this tangle of issues… and how you feel they might or might not relate to the Raleigh house. Thanks, David… great to hear your views on the issue. From what I’ve seen of Clay’s work, I have no doubt about either its lovability or durability. And I share the hope that the house might be key to positive change in the neighborhood. Every neighborhood changes… the only question is whether it will be good change or bad change. A neighborhood without a historic district overlay in the city’s zoning – a neighborhood where you can build whatever you want once you own the land. There are many of these, and often a couple with modernist tastes do not want to build there because it lacks the frisson of insulting the neighbors. In my piece I am giving the intentions of the Cherrys a nice interpretation. I can’t think of an example of “a more contemporary neighborhood”…what do you mean?